In this project, we aimed at analyzing native (or free) amino acids with supercritical fluid chromatography coupled to mass spectrometric detection, with modern instruments and methods, and maintaining as simple a mobile phase as possible to ensure applicability of the method. The purpose was twofold: (i) a generic method allowing for satisfactory elution of a wide range of amino acids (acidic, basic, or neutral residue) and (ii) resolution of the enantiomeric pairs. 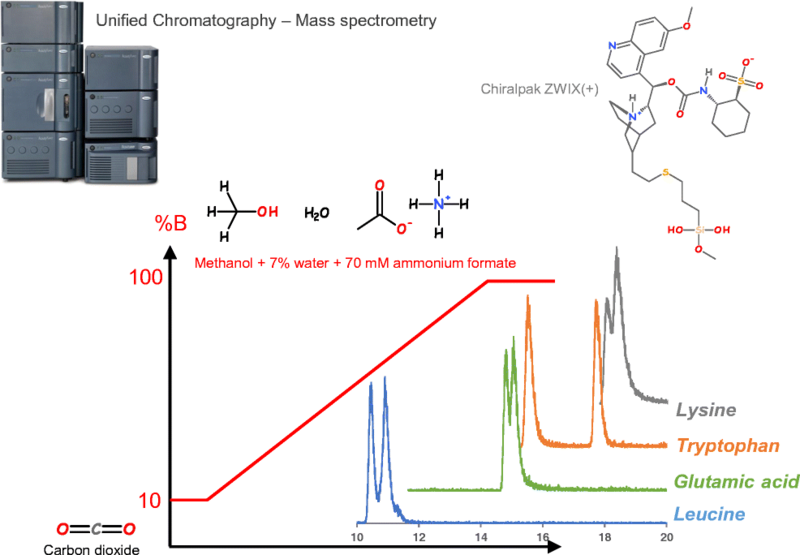 The Chiralpak ZWIX (+) and (−) stationary phases were selected as they are well-known for the enantioresolution of amino acids in liquid chromatographic modes. A wide range elution gradient, starting with a large concentration of carbon dioxide (90%) and finishing at 100% solvent (methanol containing 70 mM ammonium formate and 7% water) allowed the elution of 18 native proteinogenic amino acids out of 19 injected. In these conditions, enantioselectivity was achieved for 16 of them. The basic amino acids (arginine, histidine, and lysine) were the most difficult to elute in these conditions, resulting in rather poor peak shapes. Cysteine was never observed in any of the conditions tested. Sample application was attempted with two food supplements, tablets containing a mixture of 17 proteinogenic amino acids and capsules containing taurine and theanine that were not present in the standards used for the method development. The sample preparation method was very simple, involving dissolution of the tablets and capsules in acidified water, filtration, and dilution with methanol. 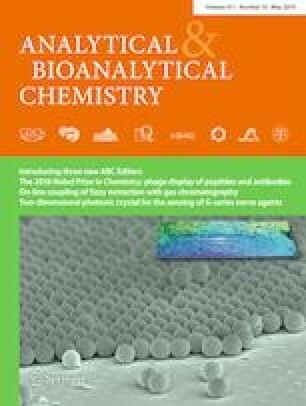 Mass spectrometric detection (electrospray ionization with single-quadrupole mass detection) allowed for unambiguous identification of most amino acids, except for the leucine and isoleucine isomers that were not separated by the generic gradient. The observation of taurine and theanine also suggests that the method should be generally applicable to other native amino acids than the proteinogenic amino acids selected for the development of this method. As peak shapes and signal-to-noise ratios could still be improved, further developments are wanted to upgrade this method. Due to the wide gradient (10 to 100% co-solvent in carbon dioxide), the method cannot truly be called either supercritical fluid chromatography (SFC) or enhanced-fluidity liquid chromatography (EFLC), but should be related to “unified chromatography” (UC), joining SFC and HPLC. The online version of this article ( https://doi.org/10.1007/s00216-019-01783-5) contains supplementary material, which is available to authorized users. Adrien Raimbault is grateful for a PhD grant received from the Ministry of Higher Education and Research. Magdalena Dorebska received support from Erasmus program, from the Jagellonian University (Krakow, Poland) and the University of Orleans, France. Caroline West is grateful for the support received from the Institut Universitaire de France (IUF), of which she is a Junior Member. Waters Corporation is acknowledged for the support received through the Centers of Innovation program. Dr. Pilar Franco (Chiral Technologies) is acknowledged for the kind gift of Chiralpak ZWIX columns.